Figure 1. 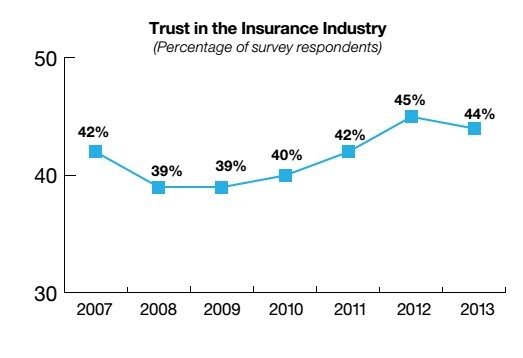 Trust in the Insurance industry. 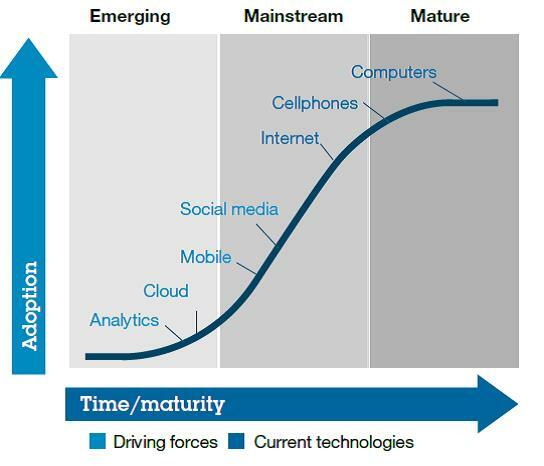 Source: IBM Institute for Business Value. 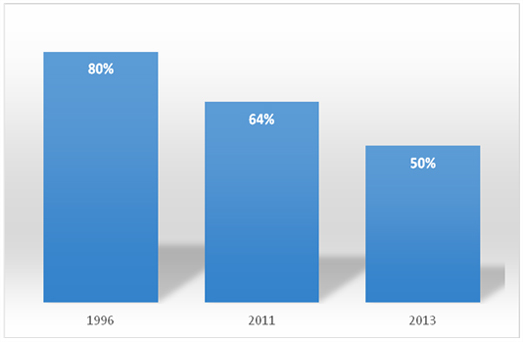 Survey data 2007-2013. Under these circumstances, the right insurance software seems to be more crucial than ever. We cannot but admit that largely, insurance organizations today succeed to harness modern software development potential. This very article is an attempt to dwell on the way they do it. Firstly, modern insurers seek to reach their customers through a wide range of devices and channels as customers' experience in terms of digital information grow. Gartner's puts it as Number One Business Trend influencing insurance in 2014. One can definitely talk about a shift of the channels that insurance companies use to supply their services. Thus, the IBM Institute for Business Value has made a report on "digital reinvention" in insurance industry (2013). The fact is that consumers are ubiquitously connected. The 2013 report showed the "saturation" in the use of mobile phones (95% of the respondents surveyed) as well as quick adoption of the-latest-trend devices such as tablets (47%) and e-readers (34%). It is worth mentioning here that 81% of the IBM report-2013 respondents participate in social networking, like Facebook, Qzone or Mixi, which was indicated as an increase by 10% points since 2012. Consequently, the influence of customers on the companies is rising. That is why we can definitely see today digital transformation of insurance services. Figure 2. The popularity of face-to-face interaction while buying a life insurance is decreasing. (Source: the studies of LIMRA and the Life foundation). Secondly, according to the above-mentioned report (US-based analyst company), 85% of the respondents said they would use the Internet to buy a life insurance. The biggest insurers have caught this insight and supply their customers with insurance services online. For this research, we have explored the online services of the richest insurers according to Moody's. For example, MetLife, number one in Moody's ranking with $1,335 in 2014, number two – American International Group with $ 1,249, number three Prudential Financial Inc. with $1,049 in 2014 and other top insurers. Applying here is easy. You can easily get a quote for any kind of insurance, get a term insurance online, manage your account, have a rep contact you, get covered online now, offer your employees voluntary insurance, manage your policy within the insurance companies, etc. To put it in other words, modern software enables insurance companies to build a person-person centered economy where each service channel provides a special consumer experience and drive new profits. Consequently, IT developers' services obligatory include insurance software development with omni-channel experience to increase customer engagement and retention as well as be present in the financial lives of their clients any time and any place. Dwelling on multi-channel insurance experience, we should talk about mobile revolution as well. Insurance companies today tend to take advantage of mobile communication and harness mobile apps that help to digitalize transactions and processes as well as to streamline them. We are at the beginning of a new mobile era. Mobile insurance apps supply customers with easy-to-access insurance information, an insurance policy at any time, support from insurance service providers as wells as allow new customer-oriented models. Figure 3. New driving sources of the insurance industry. Modern software capabilities enable deeper business intelligence and consumer insight. More CIOs in the insurance industry seek to consolidate their systems onto a single platform. Let's have a look. Data can be definitely called as lifeblood of insurance industry. In order to leverage information top insurers are successfully implementing Customer Relationship Management Systems. CRM systems have become the right strategy for all insurers who are eager to retain their clients and consolidate the data. As one of our clients, an insurance company, for which we are currently developing a tailor-made CRM solution, has put it, "Consumers may allow access to them only in return for value". CRM does add value to customer service and makes it possible to bring business insights for the masses. Apart from CRM, insurers widely take advantage of business analytics apps, insurance data exchange solutions, corporate portals, and mobile optimized websites to cope with an information stream. In others words, these are software solutions that optimize insurance business. Overall, insurance companies harness the potential of SaaS. Actually, many insurers were concerned about security risks but rising competitiveness forced them to look for a solution that helps to minimize costs. They started to implement SaaS solutions to improve efficiency at a lower cost. By the way, European Commission has proposed regulation on the protection of insurance customers with regard to the processing of personal data and free movement of such data. As a result, adoption of SaaS solutions in Europe is high. Recently Elinext Group has also had an order to develop a SaaS solution for Fortune 100 companies. The latest findings from SAP SE and analyst company headquartered in London — Ovum, dated September 10, 2014, show a big demand for cloud technologies among retail and insurance companies. Phone surveys were conducted with IT decisions makers in 400 banks and insurance companies from North America, Europe, Asia Pacific, the Middle East and Latin America. Thus, SaaS is already supporting a majority of functions within business as evidenced by 42% of banks and 36% of insurers. The respondents also indicate that SaaS is the preferred option for 27% of banks and insurers, with a further 42% considering it for every IT project. The same survey states that many insurance companies are still concerned about regulatory compliance (36%), reliability (35%) and difficulty of SaaS integration within existing systems (31%) calling these factors the most difficult barriers to adopt SaaS. Judging by our business experience in this sphere, we predict that the need to reduce costs will make an imperative for insurance companies to explore benefits from SaaS-based solutions as well as to adopt them in the nearest future. Apart from all, the current economic situation forces insurers to harness the potential of risk management software. Gartner's says that insurance firms are already spending nearly 30% of their annual IT budgets on it. Nevertheless, investments in better data quality will be obligatory as a higher degree of automation and scalability will be needed. Summing it all up, specialists admit that the right software definitely removes complexity and pressure of today's insurance market. The best way out for insurers is to take note of the IT insurance trends and be in a better position to manage profitability of your insurance business.